I’d never heard of the Jungfrau Marathon until I was skiing in Switzerland in March 2002. In fact, despite being a runner for around 20 years by then, I’d never felt any burning urge to do a marathon — the furthest I’d ever run in one go was around 20 miles and that had felt quite far enough, thanks. There was obviously no way I could run that year’s race so I instead targeted 2003, won a place in the ballot, and turned my attention to some serious training. My plan was to get at least one other marathon under my belt before heading for the Alps, and add in some hill training. And so fast forward to June 2003 and the Edinburgh Marathon, my first. I ­finished in just under 4 hrs 30 minutes and felt fine — but I also realised I was neither fit enough nor confident enough to do the Jungfrau that September, so I instead ran the Loch Ness Marathon (a bit faster) and London in April 2004 (faster still). At this point I realised I needed to start running some proper hills, and that’s when I joined Aberdeen’s brilliant Cosmic Hillbashers and spent the summer playing backmarker on club runs up and down some of Aberdeenshire’s most iconic hills. 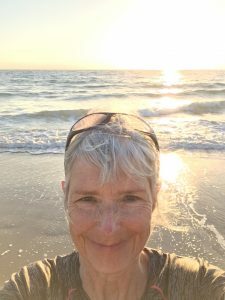 It was hard work — really hard work — but I got my legs and lungs used to the idea of going uphill for sustained periods and became stronger with every run. The Jungfrau Marathon was, and still is, without question the toughest race I’ve ever taken part in — and also the most rewarding. It’s a race of two halves — the first 21k is pleasantly undulating, starting in the lovely town of Interlaken and following the river Lutschine through chocolate box villages along the Lauterbrunnen valley. I’d been warned (and warned and warned and warned) about the second 21k, so I took that first half really slowly, never getting much out of neutral. Suddenly the route went off-road and sharply uphill, zig-zagging up through pretty woodland for more than 5k to Wengen. The wheels fell off for many here, those who’d hammered the first 21k, and this bit of the route is apparently nicknamed The Wall. Then it was out of the village and into the part of the route I’d only ever seen in winter, covered in snow. It was just gorgeous — it had been raining on the start line at 8:45am, but by now the clouds had burned off, and I was glad I’d got my shades and Camelbak and slapped on the Factor 15 all those hours ago. We climbed and we climbed and for much of it I walked, breaking into a run on the flat bits and then slowing down again as the gradient picked up. I wasn’t alone — only the elite ran the whole route and even much better runners than me walked substantial chunks of it. I still felt pretty good, though — pottering along, picking off folk here and there and just soaking it all in. And then came the sting in the tail: at 39k the path narrowed and went truly vertical, with a drop at either side, as we crossed the moraine below Eigergletscher. No room to overtake, all I could do was follow the runner in front for undoubtedly the toughest 1.5k of my life. Everything now hurt, and it was only knowing I was nearly there that kept me going. The last kilometre and a bit to the finish at Kleine Scheidegg is gloriously downhill and I was able to run across the finish line feeling really strong again. And I had never felt so good crossing a line — it was amazing, fantastic, just the best. I was slow, very slow — at 6:14:34 slower than I’d hoped and only 30 minutes within the cut-off time — but I’d done it, got the classy medal, got the t-shirt. Looking back, I can see with absolute clarity that central to my success in September 2004 was having a plan. With the Jungfrau Marathon, I identified exactly where I was going — that finish line in the shadow of the Eiger — and I worked out how to get there, step by step. And when I realised the goal was not yet in reach, I recalibrated, adjusted the steps I needed to take, and gave myself another year. This is exactly how it needs to work in business, and the first question I ask my clients is: ‘What’s your goal?’ Before I can even begin to help map out a marketing communications strategy for them, I need to know where they’re going, and how they intend getting there, and — most important of all — why they’re going there. And that’s as much to do with their personal aspirations as what they want for their business: any business is, after all, only a vehicle for us to take to get where we want to get. 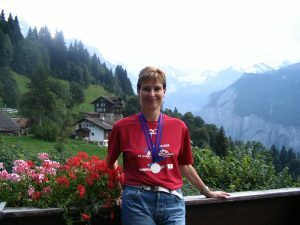 Main photo shows me towards the end of the Jungfrau Marathon, 11 September 2004. Smaller photo is me back at the hotel showing off my medal and t-shirt! Thank you for taking me on this journey with you Eugenie. What a setting! 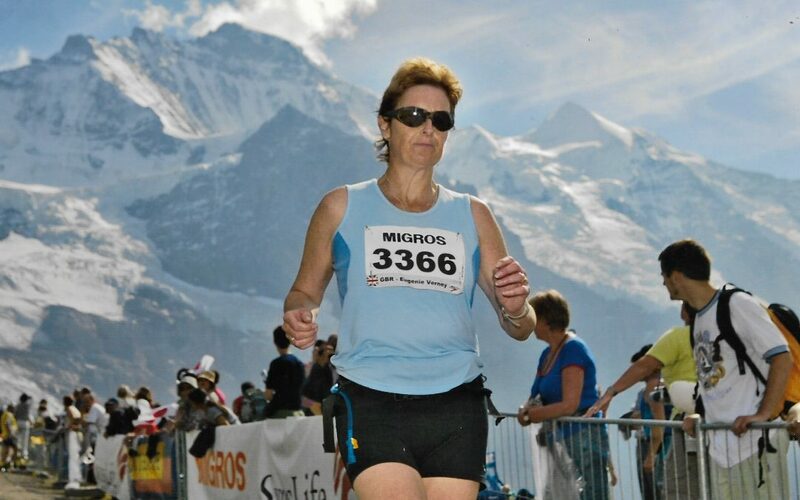 What an accomplishment a regular marathon is…the Jungfrau is really a feat! I also love the business analogy and segue. Wonderful write up! How did the runners get back to the starting point?